Our plan was to sail to Ambryn to climb the vulcano but we realised that it was not so good to arrive on a Sunday as nobody works on Sundays. 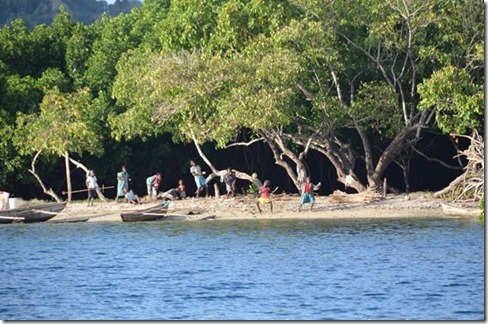 We changed our plan and headed for the Maskalyne Islands on the south end of Malekula. We had a nice sail west from Lamen bay on Epi. we stopped for lunch and a snorkel close to the reef near Khuneveo Island. After lunch we decided to look for a more sheltered anchoridge for the night and ended up in a shelterd place on the west side of Awei Island. There was lots of Mangroves there but also a couple of small beaches. The bay was filled with dug out canoes out fishing and unusually it was women in all the canoes. After a while our Australian Mark started the Saturday night entertainment with a show of Coo-eee screaming and leg wiggling. The kids on the beach fell over laughing. Mark leads the entertainment. The kids are following. All followed by a lovely dinner from our French chefs with Tif as head cook.